This stunning space wallpaper shows a swirling starscape above ESO’s La Silla Observatory. Also, if you look very closely, you can see not one, but three horizontal trails from three separate planes, moving from left to right in the sky. This stunning space wallpaper shows a swirling starscape above ESO’s La Silla Observatory. Also, if you look very closely, you can see not one, but three horizontal trails from three separate planes, moving from left to right in the sky. They are not rotating with the stars, so it is clearly something a little closer to home. La Silla lies near a fairly busy flight path, and those streaks in the sky are aircraft travelling from Calama to Santiago. 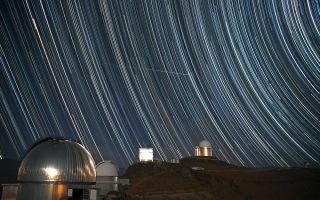 A long series of individual images have been combined to form this striking shot, allowing the motion of the Earth to be captured as it rotates, with stars producing long trails around the sky’s south pole as it does so. This image was released Dec. 20, 2014.